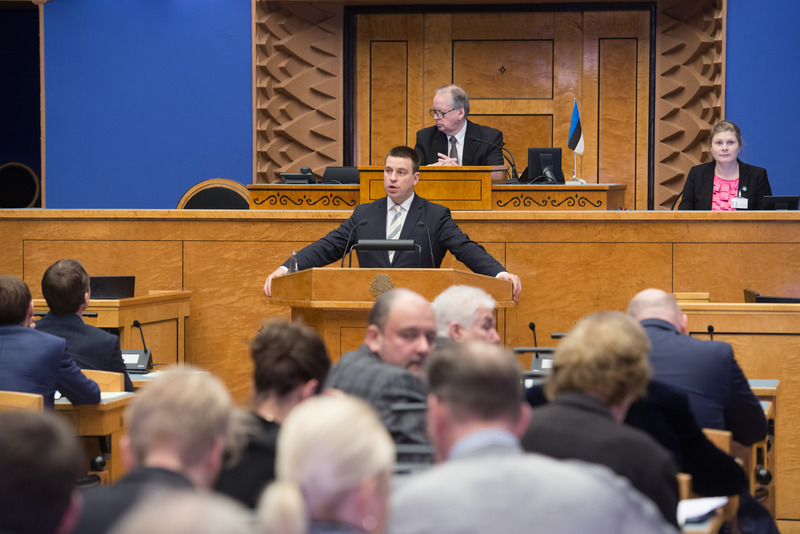 Prime Minister Jüri Ratas replied to the interpellation concerning the challenges of Estonia in connection with ageing, youth, smallness and innovation (No. 358), submitted by members of the Riigikogu Urve Tiidus, Terje Trei, Igor Gräzin, Laine Randjärv and Urmas Kruuse on 4 May. The interpellators referred to the saying “ageing Estonia” that is being heard increasingly often in public. The phrase which has a somewhat negative undertone contains the objective fact that the life expectancy of people is extending and the proportion of people of advanced age is increasing in Estonia. This is accompanied by incantation as to whether the Estonian nation will eventually survive and how the younger generation will cope with covering the costs of pension, health, social services and social protection. A society that acts wisely and with foresight will manage. The interpellators pointed out that the progressive countries of the world invested in people and in teaching new skills regardless of age. The interpellators wished to know the Prime Minister’s assessment of how Estonia fit into that picture. Ratas said that, in the previous year, the indicator of participation in life-long learning had risen to the highest level in Estonia. “In 2016, 15.7 per cent participated in life-long learning, if we take the range of 25–64-year old people,” the Prime Minister said. He explained that the Estonian educational legislation and organisation supported the possibility to study throughout or during the whole lifespan, this means definitely also in adulthood. Access to life-long learning means that everyone can learn, regardless of their age, social or economic background, gender, ethnicity, place of residence or special educational needs. For that, educational institutions providing a wide range of studies, various flexible forms of study and flexible curricula are needed. It is also important that necessary supplementary measures to support participation in studies are applied. “Very important measures that support access to life-long learning are certainly connected with study loans and study leave and the possibility to receive them, but naturally also with health insurance. To link education system with the labour market, a system of professions has been created with the aim of making the skills and needs required by the labour market visible, understandable and certainly also comparable for the training providers and learners. Ratas explained that the Ministry of Education and Research had created possibilities for developing professional skills to people with lower educational level and without professional training. Also, with the support of the Social Fund, it has created possibilities for adults to develop the key competences of life-long learning. The Unemployment Insurance Fund has continuously expanded the offering of training to the unemployed, and as of 1 May this year new training services have opened also for working people whose skills are out of date and who are facing the risk of becoming unemployed. The Ministry of Economic Affairs and Communications has launched measures to develop the digital competence of adults. “And of course I do not wish to stop at these results. We consider it important that adults’ access to studies and continuous professional development would increase,” Ratas confirmed. The Prime Minister said that he had always emphasised very strongly the aspect of life experience. “It disturbs me very much when it is said that when a person is 60 or 65 or 70 or 75, or even 80, then he or she no longer fits to the labour market. 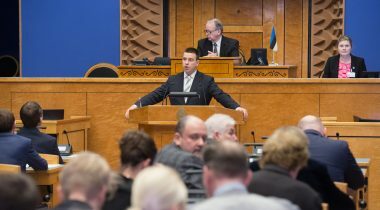 On the contrary, I think that the role of life experience is very important in the Estonian society,” Ratas said. The Prime Minister also replied to the interpellation concerning manipulations of administrative reform to give better position to the ruling political parties (No. 357). The Minister of Entrepreneurship and Information Technology Urve Palo replied to the interpellation concerning the promotion of innovation in the Estonian economy (No. 359). The Minister of Economic Affairs and Infrastructure Kadri Simson replied to the interpellation concerning the express train stop in Tabivere (No. 355) and the interpellation concerning the cost-benefit analysis of Rail Baltic by Ernst & Young (No. 360). The Minister of Public Administration Jaak Aab, the Minister of Defence Jüri Luik, the Minister of the Environment Siim Valmar Kiisler and the Minister of Finance Toomas Tõniste took their oaths of office before the Riigikogu. During the open microphone, Jüri Adams took the floor. The sitting ended at 8.23 p.m.